WALKOUT LOT - 5.56 ACRES ON BEAUTIFUL PRIVATE WOODED AND ROLLING CHESTNUT HOME COMMUNITY. SALE OF LOT ONLY WITH BUILD FROM CHESTNUT HOME BUILDERS. PAVED ROAD, NATURAL GAS AND HIGH SPEED INTERNET AVAILABLE. SITES ARE SURVEYED AND READY FOR YOU TO BUILD A CHESTNUT HOME. WOODED MATURE TREES LINE THE ENTIRE BOUNDARY. 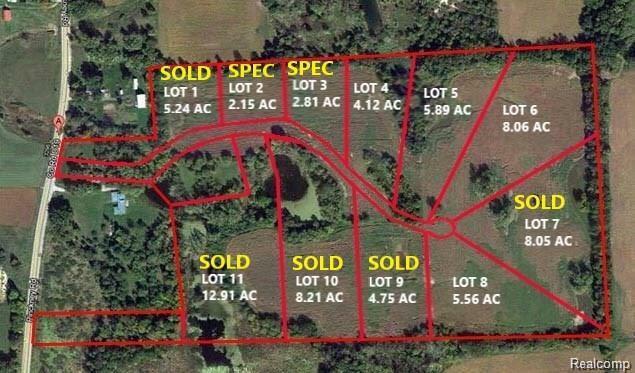 SUPREME LOCATION IS 3 MILES SOUTH OF I-96 HOWELL EXIT AND SURROUNDED BY 450 ACRES OF FARM LAND. NEIGHBORHOOD IS READY FOR YOU TO DRIVE THROUGH. OUTBUILDINGS AND HORSES ARE ALLOWED. NO HOA. VIEW OUR BEAUTIFUL HOME PLANS TO BUILD, BUILDER CAN ALSO BUILD BARN. SEE ALL AVAILABLE HOME PLANS AT CHESTNUT BUILDERS WEBSITE. HOMES RANGE FROM $350,000-$650,000 PLUS LOT PRICE.